Batman and the Monster Men! 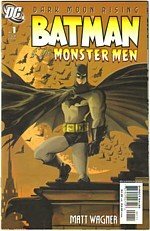 Batman and The Monster Men, published by DC Comics, 144 pages, $14.99. I love a good Batman tale. I’ve also always loved the work of Matt Wagner. Batman and The Monster Men would seem proof of the belief that you can’t lose when the two get together. Taking place one year into the Batman’s career, the story reintroduces Professor Hugo Strange. Strange is a scientist who truly seems to have mankind’s best interests at heart, desiring to better the species through genetic research. He is not portrayed as your run-of-the-mill “mad scientist” character, much to Wagner’s credit. His methods of improving said species, however, are chilling. Wagner successfully conveys a sense of terror throughout the story, as Batman tracks Strange down and confronts his “Monster Men.” Proving his versatility, however, he also gives the story a definite “crime noir” sensitivity, and even includes one laugh-out-loud scene that takes place between Bruce and Alfred in the Bat Cave. Far be it from me to give it away, but it involves the Batmobile and demonstrates Matt Wagner’s talent and versatility as a writer. As a writer and an artist, Wagner has proven in the past that he knows Batman, young and old. This is the former. Strong, confident and determined. But, still new to the game, still finding his role as crime-fighter. Still trying, and succeeding, in being the horrific “creature of the night,” striking terror into the hearts of criminals. The older Batman simply succeeds without trying. Wagner’s art style is not ultra-realistic, but that of caricature. Well-suited for this story, as the characters perfectly express the horror, anger, shock, etc. so often called for in the course of the tale. This is, indeed, one of the instances when the characters themselves are integral in the telling. Again, to Wagner’s credit. Batman and The Monster Men is recommended for older readers, not youngsters, due to horrific imagery and language. Find it at comics shops, some bookstores and online retailers and auctions.